When we meet people we’ve not seen for a while, we often ask “What’s new?”. If you get confronted with this question when not expecting it, you can get caught of guard, end up scratching your head and might even feel compelled to make something up. On ‘slow news days’, you can imagine journalists do not have a good time and some have even been known to make up ‘news’. I love it when breakfast TV reports what is ‘new’ in the newspapers. At the same time, morning papers talk about what is ‘new’ on TV. This cycle feeds itself. We all know this is all not really ‘news’ at all, even though it’s on the News and in the News-papers. You’ve also heard that phrase – “There’s nothing new under the Sun”. So is it possible that anything is actually new? Now having a dig at journalists is not the point here – they have a job to do and provide a service many people want to consume. The point is for something to be really new, it has to possess some important characteristics. Firstly, it only has to be new to us. You might know something that’s quite ‘old’ that I don’t and when you share it with me, it’s news to me. I may thank you and pass it on if I think it’s newsworthy. Secondly, it might be something that has occurred for the first time. This could be some permutation that causes us to take notice. All too often, our news reports focus on ‘bad news’ only offering a token ‘And finally …’ good news snippet at the end. What a breath of fresh air a ‘good news only’ news broadcast would be. Thirdly is the class of news I personally find the most exciting and fascinating and that’s when something new is discovered or invented. Here we are acting in a generative capacity fabricating something new from existing parts or conditions. When you are involved with ‘bringing in the new’ in this manner, and on a regular basis, it has an amazing affect on your health and well being. Being in an environment where renewal is the order of the day causes our brains to continually rewire and keeps our mind active. In turn, this active mind renews our body. What makes generation of this type of news even more attractive to workers of light is that the two practices that encourage this type of ‘newness’ are meditation and respiration. Meditation sets up the perfect conditions for light bulb moments to occur. A still mind allows ‘the new’ to arrive. In the converse situation, the same thinking delivers the same ‘old’ results. Fresh thinking leads to a fresh mind and a fresh body. The fuel to encourage the introduction of such fresh thought is specifically delivered during the in-spiration phase of the re-spiration process. The hyphenation is not only intentional but provides some elucidation as to what is occurring. As neurons do not have internal reserves for oxygen, more neuronal activity requires more oxygen to be delivered rapidly through the blood stream. Conventional wisdom suggests that more neuronal activity creates more connections and the likelihood of a ‘new’ connection being forged increases as a result. So deeper breathing while meditating causes more interconnectivity in the brain. Now this might well be ‘news’ to you but I had the light bulb moment that it might be fun to use this technique to channel in what really goes on during this process. This was the result. When you move your diaphragm, your spiritual muscle, it pump primes your pranic tube. This in turn stimulates your main chakra centres and a massive amount of intercommunication ensues. Initially this is mainly between your gut, heart and third eye. After a few minutes, the pranic force seeps outside your physical body. Via your omega chakra, a few inches below your root chakra point, your prana seeps into Mother Earth and informs her you are ready to receive. A microsecond later, it rises past your crown to your alpha chakra point just above your head. At this time, you become the pivot point between the superconsciousness and Lady Gaia – your heart being at the very centre. If at that time, you are internally silent, information transfer occurs. It seems to happen outside time and inside space. 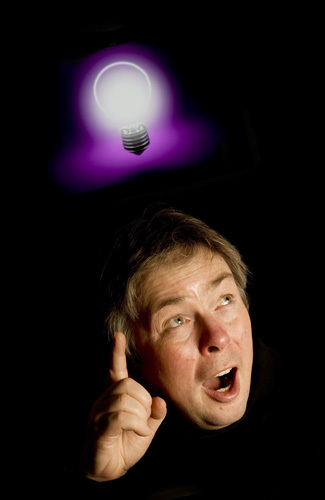 Every neuron in your brain lights up and you experience the beginning of a light bulb moment. The process is not yet complete. The information is passed to Mother Earth who checks it is safe and timely for you to receive it. It then passes into your gut centre for further ‘internal quality assurance’. Your gut then passes it to your heart centre so you can fall in love with the idea. Finally, it returns to your third eye and is allowed to enter your outer cortex and your consciousness and you get a ‘new idea’. In real time, less than a second has elapsed. Yet, as all your ‘minds’ are in agreement, you know you have to act on this ‘news’ – it just feels right. Your throat chakra might even get it on the act and shout “Eureka”! Now I am hoping this mechanism for how we receive light bulb moments is ‘news’ to some of you. It certainly is to me.